Juvenile idiopathic arthritis (JIA), one form of juvenile arthritis, is actually quite prevalent, affecting more than 50,000 children in the United States alone. JIA is often referred to as juvenile rheumatoid arthritis (JRA). Barrett has polyarticular JIA which affects five or more of his joints. When juvenile arthritis first shows its symptoms in a child’s body, many parents write off swollen joints and fever as a flu bug, or think that a sudden rash might have occurred from an allergic reaction. The symptoms might even recede slightly before showing up again, sometimes delaying diagnosis for quite some time. After all, who expects a small child to have arthritis? This was the case with Barrett. The arthritis started in his feet (as an infant) and worked it’s way up his body to his neck and jaw. Most people don’t know that kids get arthritis. A child’s immune system is not fully formed around the age of 18; so an “autoimmune” form of arthritis is especially aggressive in children, compromising their ability to fight normal diseases and leaving them open to complications that may affect their eyes, bone growth, etc. 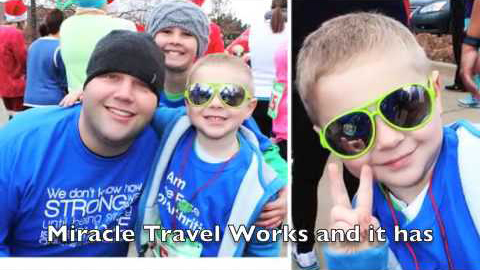 We are greatly appreciative for all of the support that Miracle Travel Works has done for our family. The reimbursements have been a blessing with traveling to the University of Iowa Hospital for Barrett’s GI and Rheumatology appointments.